With the destruction of the Death Star three years earlier, heroic Luke Skywalker (Mark Hamill), with the help of the mysterious Force, had joined with the other surviving Rebels to escape the Empire's wrath, with Princess Leia (Carrie Fisher) and other freedom fighters, on the bleak and frigid planet of Hoth. Probe droids were dispatched by Darth Vader to locate the hidden rebels. One of the many remote probes crash-landed on the desolate icy and frozen world of Hoth, and then rose up out of its crater to begin its search by floating across the ice plain. As Luke rode across the same cold and lonely ice plain of Hoth on his Tauntaun (snow lizard), he saw an object, thinking it might be a meteorite, drop from the sky through his pair of electrobinoculars. He sent a com-link message to Han Solo (Harrison Ford), reporting that he hadn't picked up any "life-readings" -- Han joked back: "There isn't enough life on this ice cube to fill a star cruiser." But Luke was planning on checking out the meteorite. As he steadied his beast, he turned to see a monstrous Wampa snow creature (Des Webb) towering over him - a big white claw swatted him and he was knocked unconscious. His mount was killed and he was then dragged across the ice. The hidden Rebel base was located in a large ice cave, where Han Solo had just returned from his own scouting expedition. His Wookiee co-pilot Chewbacca ("Chewie") (Peter Mayhew) was making welding repairs to the lifters of their damaged freighter ship The Millennium Falcon. In the Command Center, Han found the Rebel Force General Rieekan (Bruce Boa), and reported on his mission, and then explained that he was forced to leave - to pay off a debt from a previous smuggling operation, with bounty hunters on his trail: "There's a price on my head. If I don't pay off Jabba the Hutt, I'm a dead man." Rieekan thanked Solo for being such a good fighter. Solo then said goodbye to the Princess, who was frosty about his sudden departure, although she followed after him in an icy, south passage corridor and told him with a mixture of emotional and professional sentiment: "Han, we need you!...You're a great help to us. You're a natural leader." He imagined that she had feelings for him, and challenged her to give him a goodbye kiss: "Afraid I was gonna leave without giving you a good-bye kiss?" She retorted: "I'd just as soon kiss a Wookiee" to which he quipped: "I can arrange that! You could use a good kiss." They both stormed away from each other. In the hangar, the two droids - round, beeping R2-D2 (Kenny Baker) and tall, golden C-3PO (Anthony Daniels), alerted Han to the fact that Commander Luke Skywalker hadn't returned, and it was getting dark and colder: "He hasn't come back yet...Nobody knows where he is." 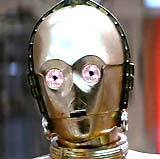 C-3PO believed Luke was "in considerable danger." Han Solo leaped onto the back of a Tauntaun and rode out into a cold blizzard to rescue his friend. Meanwhile, Luke awoke finding himself upside down, frozen by his boots and hanging like a human stalactite from a jagged cave ceiling within an ice gorge. His face was both swollen and bloody. He heard the moaning, grumbling roar of the Wampa ice monster in the distance, and saw his own, out-of-reach light-saber half-buried in the snow nearby. As he desperately tried to reach it, he concentrated and used the Force to propel it into his hands. He ignited the sword, cut himself loose with one slash, and confronted the hungry, white-furred Wampa looming toward him. With one swing, he amputated the right arm of the beast and then fled, stumbling into the frigidly-cold exterior. At the same time, Han was riding through the snow searching for him, but found nothing. As the base's shield doors were about to be closed for the night, C-3PO reported that R2-D2 predicted "the chances of survival are 725 to 1." The Wookiee let out a distressing howl. Luke collapsed into the snow, feeling the freezing cold zapping all of his strength. 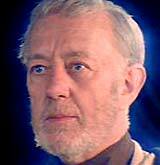 As his senses went numb, he heard Ben 'Obi-Wan' Kenobi (Alec Guinness) speak before him in a faint snowy vision, instructing him to become the Rebellion's only hope: "Luke, Luke...You will go to the Dagobah system...There you will learn from Yoda, the Jedi master who instructed me." Han located the unconscious Luke in the snow, and rushed to his side: "Don't do this, Luke. Come on, give me a sign here." At that moment, his Tauntaun bellowed and fell over dead, frozen by the cold. Solo dragged the delusionary Luke to the beast's side, cut open its belly with the light-saber, and stuffed the half-frozen Luke into the steaming carcass insides to keep him warm, and then constructed a shelter for them from supplies on the dead beast's back. 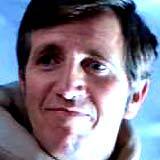 The next morning after the sun rose, a fleet of snow-speeders left the Rebel base on a search/rescue mission, and one of the young pilots on Rogue Two located them (Han sarcastically joked: "Nice of you guys to drop by") and reported their sighting. The two were brought back to the base, where Luke was treated in the medical center. He was placed in a substance within a rejuvenation chamber-tank to heal his wounds. For saving his life again, Han reminded the recovering Luke: "That's two you owe me, junior." There was another delay in Han's plans to leave - General Rieekan believed it was too dangerous for any ship to leave the base until their energy field was activated. In a consultation within the Rebel's Command Center, there were findings that a sensor was reporting a disturbance and unusual signal coming from an unidentified metal object (the Imperial probe droid) at Station 38. C-3PO surmised: "It could be an Imperial code." Solo was also suspicious: "It isn't friendly, whatever it is. Come on, Chewie, let's check it out." Out on the ice plain where the robotic device was located (and receiving instructions through its antennae), the hostile droid fired with its deadly laser ray upon Chewbacca ducking behind a snowbank as a diversion. From behind, Han blasted the droid and it exploded into many pieces, possibly from an additional self-destruct mechanism. Princess Leia knew it was an Imperial probe droid that had notified the Empire of their location when it was destroyed. Rieekan ordered the start of the evacuation of the Rebel base. Light years away on the Imperial fleet on Darth Vader's (David Prowse/voice of James Earl Jones) command ship the Executor leading the way through space with Imperial Star Destroyers and TIE fighters alongside, Imperial Force Admiral Piett (Kenneth Colley) reported to angry and skeptical Admiral Ozzel (Michael Sheard) about a fragment of a signal from a probe droid in the Hoth system, a possible life-reading. The dark figure of Darth Vader strode forward and asked: "You've found something?" Vader examined the signal's image and confirmed: "That's it. The rebels are there...That is the system. And I'm sure Skywalker is with them. Set your course for the Hoth system." 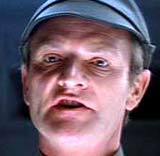 He then ordered General Veers (Julian Glover) to prepare his men. Meanwhile, evacuation measures were being undertaken at the base, and Han made last-minute, unsuccessful repairs to The Millennium Falcon, as sensors in the Command Center detected approaching Imperial ships: "There's a fleet of Star Destroyers coming out of hyperspace in Sector Four." General Rieekan ordered rerouting of all power to the energy shields, and preparations for a ground assault. 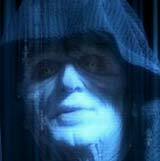 On Vader's command ship, General Veers interrupted Darth Vader in a sealed meditation chamber with news: "Com-Scan has detected an energy field protecting an area of the sixth planet of the Hoth system. The field is strong enough to deflect any bombardment." Angered, Darth Vader knew that the rebels were alerted to their presence. He was furious that clumsy and stupid Admiral Ozzel came out of light-speed too close to the system. He ordered Veers: "Prepare your troops for a surface attack." On a view-screen, Vader reprimanded Ozzel and choked him with an invisible hand. As his commander gagged to death, Captain Piett was promoted to Admiral and given command of the troops, and ordered to make sure none of the Rebel fleet escaped from the planet. Meanwhile, Princess Leia briefed the Rebel pilots about their duties. X-wing fighters escorting transport ships would pass by the energy shield and proceed to a rendezvous point, while exterior ground troops prepared to defend the main generator that powered the energy shield. The first of the transport ships slipped through the opened energy shield, as an ion cannon fired to protect it against hovering Imperial Star Destroyers. On the planet's surface, Luke and other pilots on Rebel snow-speeders were readied for the ground assault against gigantic, tall, four-legged, lumbering armored machines of Imperial destruction called Snow-Walkers, spitting laser-fire. Inside the lead Walker, General Veers surveyed the battle and his ultimate target -- the Rebel's main generator, and promised Vader: "The shield will be down in moments." Rebel troops fought off the onslaught, but the Imperial fire-power was too great. Luke suggested using harpoons and tow cables to aim for the Walker-legs - to tangle and trip them, topple them to the ground, and then cause them to explode by aiming at the Walkers' exposed necks. Princess Leia ordered evacuation of the remaining ground staff, as Han and Chewie made final repairs to their Falcon. 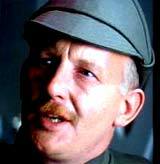 And Veers ordered his troops to prepare for a ground assault, now that they were closing in. During a pass at another Walker, Luke's craft was hit and his snow-speeder crash-landed in front of the huge feet of an approaching machine. He snatched a land-mine before his ship was crushed, ran under the Walker, fired a magnetic cable from his harpoon gun at its metal underbelly, and hoisted himself up. He cut open a hatch in the armor with his light-saber and threw the land-mine into the machine to blast it to pieces. It was the second Walker to fall - but he was left behind in the snow. The Rebel base was taking heavy fire and was in shambles, crumbling and cracking, as everyone evacuated and the relentless Imperial troops entered, while the remaining Walkers pressed forward. In the devastated Command Center, Solo encouraged C-3PO and Princess Leia, who called for retreat, to get to the last transport, but their way was blocked by a chunk of frozen ice. He raced with Leia to the Falcon as the base was infiltrated by storm-troopers - followed by the ominous figure of Darth Vader. Veers watched as the Rebel's main generator was targeted and fired upon, causing it to disintegrate and eliminate the energy field. Solo, C-3PO and the Princess reached the Falcon (although the Princess had doubts: "Would it help if I got out and pushed?") and lifted off from the hangar just in time, evading a laser cannon set up by the Imperial stormtroopers. Outside, Luke watched as it streaked past and flew off - he then raced to his own X-wing fighter awaiting him (with R2-D2) and took off - but decided to set a new course: "We're not gonna regroup with the others. We're going to the Dagobah system." TIE fighters and two oncoming Imperial Star Destroyers were in pursuit of the Falcon, but Han was able to cleverly outmaneuver them with a steep dive, and he dodged the ships. But he was unable to activate the hyper-drive to jump to light-speed. Han noted the malfunctioning hyperdrive: "We're in trouble." He decided to enter an approaching asteroid field to evade his followers, and shrugged when Leia was disbelieving - he responded: "They'd be crazy to follow us, wouldn't they?" Although pursued by four TIE fighters, his strategy was only partially-successful - two of them were blind-sided by spinning asteroids. Han then decided to fly his freighter lower into the canyon-like depths of one of the large asteroid craters, and then took refuge in a long cave-tunnel on the crater's far side, after the remaining two TIE fighters collided with each other in a narrow ravine. In his fighter, Luke descended into the cloud-covered atmosphere of Dagobah, after determining it had "massive life-form readings," but no cities or technology. But he lost flight control as the scopes went dead and he landed with a jolt in a foggy, marshy bog, surrounded by huge gnarled trees. He was uninjured, but R2-D2 fell overboard and splashed into the water, where a swamp creature took him under, but then spit him out onto the mossy, misty shore. Shaken, Luke had climbed out of his ship and was able to help upright R2, who complained that it was a "bad idea" to come there. Luke thought: "It's like something out of a dream, or...maybe I'm just going crazy." On board Vader's command ship the Executor, Admiral Piett approached Vader's meditation chamber and caught a brief glimpse of the back of the Dark Lord's scarred head, as his helmet was put into place. He reported a sighting of the Millennium Falcon in the asteroid field, but Vader was unperturbed: "Asteroids do not concern me, Admiral. I want that ship, not excuses." Vader was certain that the crew of the Falcon was still alive. He ordered continued sweeping of the asteroid field until they were found. Luke retrieved supplies from his downed, half-submerged X-wing fighter, and then in a clearing of dry ground, Luke set up camp, powered up R2-D2, and then muttered: "Now, all I've gotta do is find this Yoda, if he even exists. It's really a strange place to find a Jedi master. This place gives me the creeps. Still, there's something familiar about this place." Feeling like he was being watched from the dark trees, he suddenly whirled around to face an odd, dwarfish creature about two feet tall, dressed in rags. The little but aged, wizened, greenish fellow had large bright eyes and pointy ears, and assured Luke who had a blaster in his hand: "I mean you no harm." Luke explained how he was looking for "a great warrior" -- the creature scampered down into Luke's food supply, made a mess of his equipment, and tried to steal a tiny glowing power lamp or rod, after he replied: "Wars not make one great." 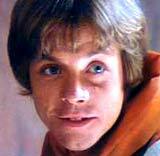 When Luke specified: "I'm looking for a Jedi master," the impish dwarf's eyes lit up: "Oh, Jedi master. Yoda. You seek Yoda...Take you to him I will. Yes, yes, but now we must eat. Come! Good food. Come!" and then led Luke into the fog. Back on the Falcon, the group soon found themselves in an unstable environment, with a malfunctioning hyperdrive. Han sought out C-3PO's advice on how to repair the Falcon's hyperdrive, and learned the negative power coupling needed replacement. Solo found Leia trying to help by opening a stuck energy valve. She admitted he was all right when he didn't spitefully call her "Your Worship," or act like a "scoundrel." 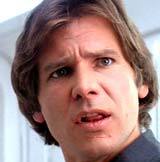 Han told her he liked the sound of that epithet: "You like me because I'm a scoundrel. There aren't enough scoundrels in your life." After she quipped back: "I happen to like nice men" - he claimed to the contrary that he was a "nice man" and coaxed a kiss from her as she mildly protested, but reciprocated. They were interrupted by C-3PO's cheerful, inopportune joy about repairing the ship and isolating the reverse power flux coupling. "There is a great disturbance in the Force...We have a new enemy, the young rebel who destroyed the Death Star. I have no doubt this boy is the offspring of Anakin Skywalker....He could destroy us....The Force is strong with him. The son of Skywalker must not become a Jedi." Vader promised with a stern oath, as he bowed and knelt, that he would attempt to make Skywalker a powerful ally: "He will join us or die, master." The wizened imp led Luke to his peculiar little clay hovel during a downpour, where the small friendly creature served a strange meal, but Luke was impatient to see Yoda and thought he was wasting his time. The creature asked: "Why wish you become Jedi?" and Luke answered: "Mostly because of my father, I guess." The creature wearily muttered to himself as he turned away: "I cannot teach him. The boy has no patience. Much anger in him, like his father." He was answered by Ben's voice: "He will learn patience." Luke realized the creature was indeed Yoda, and was eagerly ready to be trained as a Jedi, but Yoda was contemptuous: "What know you ready? For 800 years have I trained Jedi...A Jedi must have the deepest commitment, hmm? The most serious mind." Yoda accused Luke of being a dreamer of adventure, and one who was reckless, but Luke declared: "I won't fail you. I'm not afraid." Yoda answered, ominously: "You will be. You will be." A further, more extensive search for the hidden Falcon and the Rebels was conducted by TIE bombers who systematically dropped depth charges in the asteroid's caverns and tunnels. The Princess heard and saw a winged, leathery creature with a slimy mouth and eyes in one of the viewports, as it banged on the ship's hull. Donning gas masks, Han and Leia went out to investigate and Han blasted the menacing Mynock with a laser bolt. But more Mynocks attacked, with the harmful potential to chew on the craft's cables and disable it. And then the wet, strange ground of the cave began to buckle and shudder as it moved. Han ordered the ship to be fired up and depart - but as they approached the mouth of the cave to exit, they saw a row of sharp, jagged stalactites and stalagmites that surrounded the collapsing entrance. It became clear that the cave was a creature - they were in the gullet of a giant space worm with enormous teeth! The Falcon turned sideways and narrowly escaped between two teeth, and they launched just before being caught between its jaws. Training commenced for Luke in the marshy jungles of Dagobah, where he swung on long tree vines, and his physical endurance was tested (with Yoda riding on his back). Yoda taught: "Yes, a Jedi's strength flow from the Force. But beware of the dark side. Anger, fear, aggression. The dark side of the Force are they...Easily they flow, quick to join you in a fight. If once you start down the dark path, forever will it dominate your destiny. Consume you it will, as it did Obi-Wan's apprentice" - a reference to Vader. 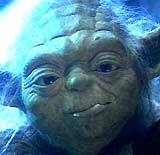 Yoda warned that the dark side wasn't stronger, only "quicker, easier, more seductive." Yoda added: "A Jedi uses the Force for knowledge and defense. Never for attack." Luke sensed something was not right in a nearby underground cave, and Yoda urged Luke to enter its dark side and "domain of evil" - where he found himself face-to-face with Darth Vader! The two combatants ignited their light-sabers and dueled together - and with one sweeping blow, Luke beheaded Vader. But when he looked to examine the decapitated head in the armored black helmet lying on the ground, he gasped when he saw only his own face. It meant he was not yet ready to face Vader. Onboard his Star Destroyer, Darth Vader had called in the galaxy's most notorious bounty hunters to find the Millennium Falcon. He offered a "substantial reward," but insisted that they must be captured alive ("No disintegrations"). However, a report from the Star Destroyer Avenger claimed that Imperial fighters had already located the Falcon, and its tail (the main rear deflector shield) had been struck by a blast, crippling it from entering light-speed. With a desperate counter-attack maneuver, Han turned his ship around and aimed directly for the bridge of the Avenger. The assault tactic worked as the Falcon targeted the enemy, and then veered off and vanished completely. 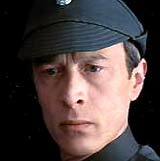 Imperial Force Captain Needa (Michael Culver) realized he must report to Darth Vader and apologize for their disappearance. In the muddy bog, Luke continued to be trained, practicing balance and levitation to master the Force. He complained about his sinking X-wing fighter, now submerged in the muck, and feared he could never leave. Rather than being negative about it, Luke was prompted by his mentor Yoda ("You must unlearn what you have learned") to use the power of the Force to move the object, no matter its size. On his first try, the ship rose, but then sank back, and Luke lost hope. Yoda demonstrated his own belief in the Force and its power and gently raised the ship from the bubbling slime and guided it gently to dry land. Luke was dumbfounded ("I don't believe it"), which was exactly Yoda's point: "That is why you fail." In front of the furious Vader, Captain Needa apologized and then fell dead. Vader commanded, through Admiral Piett, that the full fleet conduct a search for the Falcon, and warned: "Don't fail me again, Admiral." Han's Falcon had not disappeared into light-speed as believed, but had clung to the side of the hull of the Star Destroyer with a landing claw, and was hiding, with all its power circuits shut down. Han rightfully guessed that the Imperial fleet would dump its garbage before entering light-speed, and they could be detached among other debris. He then set course to navigate to a "safe port" -- a small tibanna gas mining operation at Bespin owned by his old friend Lando Calrissian (Billy Dee Williams) - "a card player, gambler, scoundrel." However, there was one ship silently trailing the Falcon - it was the ship of bounty hunter Boba Fett (Jeremy Bulloch). More difficult lessons were provided by Yoda to give Luke an understanding of the Force, stressing: "You must learn control." He suddenly felt a powerful wave of fear and had a terrible future vision of his friends (Han and Leia) in pain and danger - "I saw a city in the clouds." Yoda cautioned him about leaving prematurely: "But you would destroy all for which they have fought and suffered." The floating Cloud City that Luke envisioned was on the planet Bespin, where Han had flown the Falcon for refuge and repairs on the hyperdrive. Cape-wearing Lando greeted them after they were permitted to land - warmly hugging Han after first hiding his friendship with him: "How you doing, you old pirate?!" According to Han, Lando lost the Falcon to him "fair and square." Lando also met the Princess, and used his smooth charm on her. As he led them inside the citadel, C-3PO lagged behind and walked through a doorway into a restricted area - where he heard a familiar R2 unit. After intruding into a locked chamber, he was blown apart by a blaster. Luke continued to be impatient and wanted to prematurely leave Dagobah to aid his friends. He ignored Ben's advice about leaving before he was a fully-trained Jedi knight, and about facing temptation from the dark side and becoming an agent of evil: "It is you and your abilities the Emperor wants. 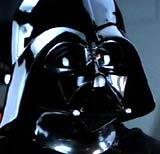 That is why your friends are made to suffer....I don't want to lose you to the Emperor the way I lost Vader." Luke flew off from Dagobah anyway but promised to return, as Yoda knew that he was choosing the "quick and easy path as Vader did," and considered him "reckless." Yoda muttered: "Now, matters are worse." Ben replied: "That boy is our last hope." Yoda responded: "No, there is another." In the Cloud City on Bespin, Chewbacca found the disassembled parts of golden droid C-3PO on a conveyor belt in a junk room, and brought the pieces to the living quarters provided for Han and Leia. As Lando invited them away for refreshments, he described how he had recently made a deal that would keep the Empire out of his small mining business operation. As he opened a door to a room with a long banquet table, the figure of Darth Vader emerged at the head of the table. Han drew his blaster and fired, but the shots were deflected and the weapon was seized from his hand. Lando apologized and admitted that he had no choice, since the stormtroopers and bounty hunter Boba Fett arrived right before they did to force the deal. 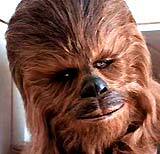 Chewie was confined in a prison cell with C-3PO's disattached parts. The Wookiee tried to reassemble and reactivate the droid, by placing its head on its torso, although at first, he had the head on backwards. Nearby, Han was also imprisoned - held by straps and lowered onto a torture device that sent electric shocks through his body. The menacing Vader instructed Boba Fett: "You may take Captain Solo to Jabba the Hutt after I have Skywalker." He also told Lando that Leia and the Wookiee must never leave the Cloud City, reversing previous agreements he had made with Lando. A battered and bruised Han Solo and Leia were flung into Chewie's cell, where Lando told them that Vader was turning Han over to a bounty hunter, and that Vader was setting a trap for Skywalker, using them as bait: "He's after somebody called Skywalker." Han fought back and slugged Lando, but was subdued by Calrissian guards. 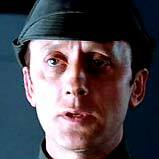 Vader prepared a primitive and crude chamber - a platform within a pit surrounded by pipes, hoses, and tubes of chemicals. It was a carbon-freezing facility to be used to immobilize Skywalker, already on his way in his X-wing fighter to the planet, so that he could be frozen and transported undamaged to the Emperor. Vader's intention was to first test the freezing chamber on Han Solo. Chewie vainly fought off some of the stormtroopers until Solo calmed him and told him to "save his strength - there will be another time." Princess Leia kissed Han as he was about to be dipped in a carbonite-freezing chamber - she confessed: "I love you" to which he replied: "I know." Moments later after Han was encased in carbonite, big mechanical tongs extracted the thick metal block from the pit and it was laid flat on the platform - showing Han's imprint. 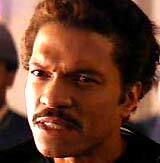 Calrissian declared that Solo was still alive and had survived the freezing process ("and in perfect hibernation"). Vader turned Han over to bounty hunter Fett. He then ordered preparations of the chamber for their new arrival, and altered his deal with Lando - specifying that the Wookiee and Leia would be taken to his ship. On guard, Luke flew into Cloud City without any patrol ships or signs of hostility, and entered a passageway-corridor with R2-D2 as they progressed to the central plaza. He watched as Han's encased body was pushed along and followed by armed stormtroopers. Luke also saw the Princess, Lando, a disassembled C-3PO and the Wookiee being led by other stormtroopers down a second corridor and heard Leia calling out a warning to him: "It's a trap." He found himself in the large carbon-freezing chamber where he sensed Vader's dark presence, before he saw his silhouetted figure: "The Force is with you, young Skywalker. But you are not a Jedi yet." They ignited their light-sabers and began to duel. Meanwhile, as Lando and the others were led by a squad of stormtroopers, it was revealed that Lando had alerted his men to ambush the Imperial guards at an intersection. The guards were disarmed, imprisoned in a security tower, and their weapons were taken. He told Leia: "We're getting out of here" while releasing Chewie's bindings. Lando pleaded for them to trust him: "I had no choice...There's still a chance to save Han at the east platform." But they were too late - Boba Fett's ship had already taken off. Luke was horrified and gasped: "No, no. That's not true. That's impossible!" Vader promised: "You can destroy the Emperor. He has foreseen this. It is your destiny. Join me and together, we can rule the galaxy as father and son. Come with me. It is the only way." With no other alternative, Luke stepped off the platform and fell into the chasm. After tumbling through various shafts and pipes, Luke hung onto Cloud City's weather vane beneath the large floating structure, and desperately called out for Ben to help him, but there was no response to his plea. He then appealed to Leia, calling out her name. Somehow, she heard his cries and demanded that the surviving group go back to Cloud City, amidst TIE fighters and a complete evacuation. They found the battered Luke hanging underneath the City, maneuvered the ship perfectly underneath him, and opened the top hatch as he dropped into the Falcon. Then, they retreated from TIE fighters and prepared to jump into light-speed with the supposedly-repaired hyperdrive. [Back on his Star Destroyer, Vader announced that he had ordered the deactivation of the hyperdrive and was preparing a tractor beam to capture them and board the Falcon freighter.] Vader called out for Luke, who responded: "Father." Vader requested: "Son, come with me," as Luke also cried out for Ben, asking: "Why didn't you tell me?" Vader added: "Luke, it is your destiny." Before their capture by the tractor beam, R2-D2 repaired the hyperdrive and the Falcon's occupants were thrown backwards by its thrust. Vader watched helplessly as his prey disappeared. Rebel forces assembled in another distant part of the galaxy, where on a medical frigate, Luke's hand was being treated and replaced with a bionic one. On the Falcon with Chewie as he departed, Lando communicated that he would begin a search for Jabba the Hutt and his bounty hunter - to find Han Solo. Lando would plan to meet up with Luke at a rendezvous point on Tatooine. Luke's final words to Lando were: "May the Force be with you." Princess Leia, Luke, and the two droids watched through a wide viewport as the Falcon raced from the Rebel cruiser through the sky after takeoff. The second film of the series (in the original saga), the series' first sequel, and the fifth film in terms of chronology. 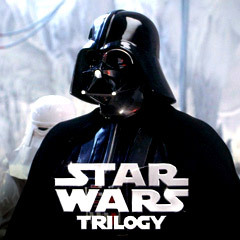 It was set three years after the events of the first film (Episode IV), and considered by many to be superior to its predecessor. With a production budget of $18 million, grossed $4.9 million in its limited opening weekend and overall grossed $209.4 million (domestic), $290.5 million (lifetime domestic gross), and $538.4 million (worldwide). It was the highest grossing (domestic) film of 1980, besting comedy 9 To 5 (1980) in second place at $103.3 million. Nominated for three Academy Awards (Best Art Direction, Best Original Score), winning one (Best Sound); winner of Special Achievement Award for Visual Effects. Set-pieces: the ground assault-battle between the Hoth planet rebels and gigantic Imperial Snow-walkers, the dizzying asteroid field chase scene with the Millennium Falcon escaping TIE fighters while darting between giant tumbling boulders, and later barely escaping a cave which was in fact a giant space worm's gullet, the initial light-saber fight in a cave between Luke and the dark force of Darth Vader, the levitation of Luke's X-wing fighter by Yoda, and the climactic lightsaber battle between Luke and Vader. Famous for Darth Vader's line: "No, I am your father" after the severing of Luke's hand.